Rev. Timothy Beardsley (Part Time Local Pastor) from Peninsula Delaware Conference to Kemblesville UMC (3/4 time appointment and 1/4 time direct hire). Rev. 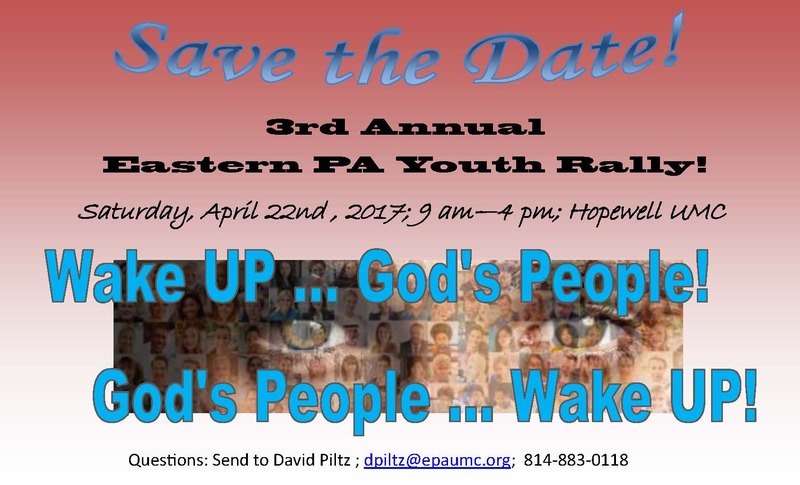 Laurie J. Pfahler (Local Pastor) from Pottstown: First and Pottstown: Salem (CE) to Langhorne (EA). Rev. Roy Lewis (Retired Full Elder) from Lahaska to retirement without an appointment. Rev. Gregory G. Holston (Elder) from 3/4-time at Philadelphia: New Vision UMC (Central District) to 3/4- time at Philadelphia: Janes Memorial (East District). Rev. Sunil Balasundaram (Full Elder) from Lickdale: Trinity to Conshohocken. The Conference Office will be closed on Tuesday and possibly Wednesday, March 14-15, due to weather forecasts of up to 2 feet of snow. As usual we will follow the Methacton School District's open or closed decision, which can be found here . While news reports about inclement weather tend to offer worst-case scenarios, reports today show that minimum snowfalls throughout the conference region most likely will be significant. County Emergency Management agencies may reach out to churches to serve as warming centers in case of power outages. Warming centers are typically the first need in winter storms that churches are equipped to handle. So if it is safe for you to open your building to serve in this capacity, it is a great way to be a Christian presence in the community. Reminder: report any property damage to your church's buildings to the District Superintendent's office. And please let us know how you are serving others during the storm and aftermath. The conference partners with many groups to serve, and the more we know about each other's response efforts, the better we can serve the community. Please e-mail or text information about any UM church-involved weather emergency and/or service response to the Rev. Greg Ellis at gellis@epaumc.org (cell phone: 484-350-5965) and also to the John Coleman, Communications Director, at communications@epaumc.org (cell phone: 443-745-5654), in addition to the appropriate District Superintendent's office. Bishop Peggy Johnson shared a message of hope and solidarity for Latina immigrant detainees at the Berks County Residential Center Sunday, March 12, surrounded by about 90 people who gathered to worship and witness for justice and mercy. The hour-long, interfaith prayer vigil, which included songs, scriptures, litanies, prayers and the bishop's message, occurred outside the detention center, across from the county prison, in Bern Township. A bunch of Lenten worship services, dinners and Bible studies sponsored by various churches and mission connexions; jazz, Christian and gospel concerts at several music-minded churches; a couples retreat and a yard sale coupled with an oyster supper; a comedy theater show; and an annual men's Lenten breakfast now in its 54th year. These are just some of the sure-to-be delightful events to be sponsored in the coming weeks by churches around our conference. And all of them are promoted on our website's Local Church Events page. Check it out. You may find just the activity you need to attend to experience more faith, fellowship or fun during this time of changing seasons when we could all use a little more warmth. When hurricanes, floods, tornadoes or other disasters devastate communities across the U.S. and around the world, or refugees stream across borders, overwhelming neighboring countries, the United Methodist Committee on Relief (UMCOR) is there, whenever and wherever the need arises. We respond with resources, healing and hope, not only at the start, but long after other sources of aid have moved on. UMCOR can be there only because of our gifts to the newly renamed UMCOR Sunday offering, formerly One Great Hour of Sharing. Our special offerings on UMCOR Sunday, March 26, lay the foundation for our church's relief work by covering our administrative costs of doing business. Because of this support for UMCOR's basic expenses, all other contributions can go 100 percent to designated programs and urgent needs. Pastors and church leaders, the UMCOR Sunday Pastor and Leader's Kit offers great tools that make it easy to promote this Special Sunday and offering in your local churches. View the UMCOR Sunday Explainer Video. And remember to order your UMCOR Sunday envelopes and posters. The Helping Hands Community Center in Parryville, a ministry of Saint Peter's UMC in nearby Emerald, will open the third Lifetree Café in the Eastern PA Conference this Saturday, March 18, at 5 PM. The church-run community services center at the corner of Main and Chestnut Streets becomes part of a national network of weekly neighborhood Café sites where people can enjoy snacks and beverages over friendly, comfortable guided conversations. Those conversations are aided by brief, topical videos that can help generate keen insights about life, values and faith. The new Café in Parryville is one of several opportunities for entertainment and fellowship, including an open mic night, that the Helping Hands Community Center will host each weekly to cultivate a popular gathering spot for neighbors-both church members and nonmembers. The Lifetree Café experience is a scheduled hour of "stories and conversations to feed the soul," according to the Rev. Bill Ritzenthaler, St. Peter's UMC's pastor and the driving force behind the new experimental ministry. It's sort of like a live, local talk show, with an inspirational twist," he explained. Discussions will be guided by Pamela Snyder, a Certified Lay Minister who will help manage the weekly Café. "People today want to participate in the conversation," says National Lifetree Café founder Thom Schultz. "It's not enough to simply hear someone lecture on an important topic. People want to share their thoughts, ask questions, and tell their own stories. Lifetree offers a safe place and time to do that." Allentown newspaper The Morning Call recently shared some great news about Wesley UMC in Bethlehem--great for them and for the many people they serve through their Lehigh Valley Outreach Depot . This ambitious church mission enterprise receives, stores and provides free, donated goods and furnishings to people recovering from crises and undergoing transitions-often people who need help reestablishing their lives. The Depot has helped nearly 3,000 area families in its nearly seven years. To double down on its good deeds, it also provides a place for volunteers to assemble donated items into disaster relief kits for distribution to areas in need worldwide. But on the verge of losing its low-rent warehouse space, the Depot was itself in dire need of a new home. Now, after a long search, this ministry, where faithful volunteers try to be "the hands and feet of God" has taken a surprising "leap of faith," writes Morning Call columnist Bill White. In February they bought and began refurbishing a new, larger home in an old tire warehouse in Allentown. It required a generous donation, helpful financing arrangements and a labor of love from volunteers, so that the Outreach Depot can continue to fill gaps in people's lives. Read this uplifting account titled " Outreach Depot finally has a new home " in the Feb. 21 issue of The Morning Call. And thanks to the Rev. Andrew Krpata, Pastor, for sharing this great story with us. See more great stories of local church ministry on our Methodists Make News webpage . And please send us any stories where your church, pastor or members are featured in the news. Green Lane School , located at Green Lane UMC in Philadelphia's Roxborough community, recently was named one of the "Best 10 Pre-Schools in Philadelphia." The Expertise Award is given by a company that researches schools, businesses and services in the country to name the Best 10 in each city. The school's website now proudly includes an Expertise Award badge. "Our primary goal is to provide children with a safe and caring environment that promotes learning and helps develop the whole child" reads the site's opening letter by Rita M. Stebbins, Director. "We are proud to be serving the community since 1964." Scheduled for 9 AM to 2 PM, the gathering will hear topical "TED talks"* by justice ministry practitioners and engage in small-group discussions, networking activities, biblical reflection and worship. Inspired by Christ's gospel, they will "learn and work together as leaders to help create social change and build thriving communities of shalom." Speakers will share creative ideas and practical applications that work "on the ground." A story on this event will be posted on our website on Monday, March 6.